Two former spy telescopes are now being scrutinized by NASA for use in a new scientific space mission, which would study mysterious dark energy, according to a senior official involved in the project. The satellites given to NASA by the National Reconnaissance Office intelligence agency, could be used in a project named WFIRST-AFTA (the Wide Field Infrared Survey Telescope-Astrophysics Focused Telescope Assets). The launch date is planned for around a year 2024, a report by Space.com says. 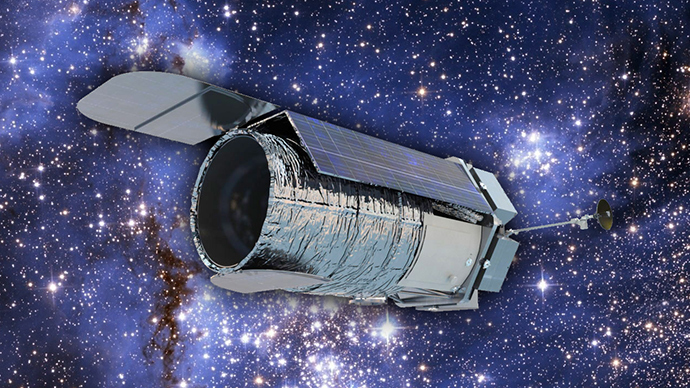 The aims of the WFIRST-AFTA project are reportedly ranging from studying dark energy, which is thought to be accelerating the expansion of the universe, to a search for exoplanets (planets that orbit a star other than the sun). The two former spy telescopes considered for use in this mission have the same resolution as NASA’s famous Hubble Space Telescope, but a field view, which is 200 times wider. “We are going to use these telescopes as they are and we do not have to make modifications, but we do have to resurface the mirror, as it's been sitting in storage, and we also need to design a spacecraft and the instruments to take advantage of their properties,” Paul Hertz, NASA's astrophysics chief, told Space.com. If the program is approved, one telescope will be used for space observations and the other will be an engineering test bed on the ground for some time and then will be freed for other uses, Hertz added. So far, the NASA scientists have been addressing the issue of the first telescope’s space location. They are debating whether it should it be closer to Earth so it can send the data to the researchers more quickly, or farther away, so the telescope can get a broader view without being blocked by planet Earth. These alternatives suggest placing the telescope either in an orbit a few thousand miles from Earth or at a stable gravitational point Earth-sun L2 around 930,000 miles (1.5 million km) from our planet. Giving an exact start date to the WFIRST-AFTA mission could prove tricky, as it will take a lot of time and effort in order for the project to come to fruition. In mid-March, WFIRST-AFTA's team presented an overview of the proposed space mission. However, it still has to overcome a number of reviews if it will ever see the light of day. Firstly, it has to get approval from NASA's astrophysics division. Then it needs to get the green light from NASA’s budgetary and request program. If all goes to plan it will be sent to the White House in time for the 2017 budget and finally Congress must approve it. Should the project be financed, the selection of the contractors will take roughly four more years. In addition, the total cost of WFIRST-AFTA is not yet known and NASA has already come under fire for cost overruns on its programs. “So we don't want to be surprised, and we don't want to underestimate that cost and give people a false impression," Hertz commented on the financial aspect of the project. NASA received the two telescopes from the National Reconnaissance Office (NRO) in 2012. They were originally intended for the ‘Future Imaginary Architecture’ program, aimed at creating a new generation of reconnaissance satellites for US intelligence. However, it was later canceled and labeled “the most spectacular and expensive failure in the 50-year history of American spy satellite projects” by the New York Times. According to David Spergel, co-chair for WFIRST-AFTA's science-definition team, the NRO’s donation of the two telescopes came as a surprise. The telescopes are still in storage with a contractor awaiting NASA’s decision about what to do with them.